Figure 2 is an attempt to emphasize this point about the simultaneity of all the inquiry activities. All the same activities are presented there but they are represented in many different combinations in an attempt to suggest that the reality of inquiry is not simple or linear. Qualitative inquiry is a process, which includes the various activities illustrated in Figure 1 [https://edtechbooks.org/-ruW] to yield both experiences and products. But any subpart of those outcomes contains the whole process and is not static but constantly 'in process.' The point is that the whole experience is more than just the parts that go into it. Learning through qualitative inquiry is a holistic experience that involves several experiences occurring together harmoniously. It does not make sense to pull the various activities associated with doing qualitative inquiry out in isolation, just as parts of holograms cannot be isolated. The processes work together and each activity a qualitative inquirer might engage in contains the essence of all other activities. The story told earlier is an illustration of two high school teachers, a student teacher, several high school students, and a university collaborator conducting qualitative inquiry as a means of enhancing their learning and teaching experiences. To clarify the qualitative inquiry process as applied to learning and teaching and its holistic nature, let's further examine the story in light of the summary in Figure 1 [https://edtechbooks.org/-ruW]. This figure shows several kinds of activities that have been grouped together to facilitate this discussion; but please keep in mind that these activities can and do combine in many different quantities and configurations. Their order in the figure is almost arbitrary. As a point of clarification, Sid and Cheryl (the two teachers) were not on this ski trip explicitly to conduct research or evaluation. Among other purposes, they were there to teach high school students how to ski, to help them integrate their experiences in the out of doors to their lives and several related disciplines (science, social studies, recreation, art, and English), and to help them learn responsibility. They were in the thick of this experience and probably did not even think of themselves as inquirers. But the claim of this book is that they were very much conducting inquiry and were learning while teaching. They were also inviting the people associated with them to do the same' the student teachers, the high school students, and me as a representative from a nearby university. Together, as a community of learners, we were engaging in several inquiry processes. Although all the qualitative inquiry activities combine in a holistic experience, several groups of activities will be isolated for the discussion below. Keep referring back to Figure 2 to remind yourself that this is an artificial isolation for purposes of discussion only. Beginning with the 'Develop a Focus' box on the left of Figure 1 [https://edtechbooks.org/-ruW], it would be fair to say we were immersed in the ski trip experience with no common explicit inquiry focus as the day began. Each participant came into this day with different assumptions about themselves and the others, about their purposes for being there, about their roles as learners, teachers, and inquirers, and different standards for judging the quality of their inquiry efforts. Each participant also came having different relationships developed with others in the setting, with different perceptions of the possible roles they and others could play, asking different questions about the scene, using different skills for gathering information to address those questions, with different ideas about how to analyze and synthesize what they would be learning, and with different ideas about the communities with whom they might share what they learned through this experience. These differences and many others based on the participants' backgrounds, personalities, beliefs, and experience lead to vast differences in awareness, initial focus, and openness among the participants. For example, Cheryl and Sid are often focused on matching their class activities to the weather when they go out on such trips. They are asking themselves how to keep the students safe while having an adventure. They are watching to see how the weather changes and how the students are responding to the experience and how they can help them see what they are experiencing and what is around them. Cheryl is particularly interested in getting to know a few of the students better on these trips because they are more open with her on an individual basis in these settings. As the trip progressed, Steve and his actions precipitated an opportunity for all participants to re-focus their individual inquiries and attention to a common project, which became the focus of the story told here. No proposals were written as part of this inquiry, though they could have been and may yet be if any participants find that this focus merits the acquisition of funds or formal review. The 'Keep a Record' box in the center of Figure 1 [https://edtechbooks.org/-ruW] is associated with activities that facilitate keeping a record of what we are learning through our inquiry. Sid and Cheryl did not keep notes or any other kind of record on this experience. They knew that I was doing so, and we collaborated in this inquiry. Jack and Steve may have kept a journal and written about this experience. In later years, all student teachers and students have been encouraged to keep such records. But in this case, my record formed the basis for the account that was presented here. This record is probably more elaborate than most teachers' accounts of their school experiences but some record is usually kept of some of the lived experiences of people in schools. The richer that account, the better the inquiry. I included records of relationships formed and forming, questions participants were asking, focuses that were forming, analyses and syntheses that developed, information that was gathered; in other words, notes on all the other activities that were going into this experience. I tried to describe what I was seeing and hearing as well as what I was thinking, feeling, and reflecting about during the experience. I also kept an audit trail or record of inquiry decisions that I was making throughout this experience. In reference to the 'Develop Relationships' box in Figure 1 [https://edtechbooks.org/-ruW] , it is clear from the story that Jack had a closer relationship to Steve than did any of the other 'authority' figures in the story. He felt that relationship was jeopardized by the knowledge he gained through the relationship; but Steve didn't think so. The whole experience strengthened and clarified the relationships between Steve and the two teachers, facilitating the inquiry they were trying to make and the inquiries I, and the student teachers were making too. Although it appears that the relationships with Steve were terminated, they were actually resumed the next year when he returned and completed the full year in the Unified Studies program. Sharing this experience together influenced how all of us were able to interact with one another and with the other students also. As a university person, I was attempting to develop a role in this scene that would allow me to be trusted by the students so they would talk to me about their experiences in this program. I found that because I was not one of the teachers and not a student teacher and certainly not a high school student, many of the students and teachers didn't know what to do with me or how to treat me. But after sharing this experience with them, they were willing to give me a place in their program and many more of them could talk to me about their feelings about the Steve story as well as other aspects of their experience after I gained entree with them in this way. The relationships we all shared grew and changed throughout the study, allowing us to shift from learning to teaching and back throughout our inquiries. We all understood that these relationships were dependent upon our treating one another ethically (as Sid and Cheryl treated Steve, in this case) over the entire school year, as well. The 'gather information' box in Figure 1 [https://edtechbooks.org/-ruW] indicates several ways in which participants may assemble information from their experiences for use in contemplating the experiences and in clarifying what other sources might add to their experiences. Simply being involved and having experiences is certainly a way to collect or generate information. We usually select aspects of our experience to focus attention on through our senses' we see (observations and document or artifact reviews), hear (conversations, interviews , eavesdropping), touch, smell, and taste (through all these collection procedures). Triangulation , using several different methods of gathering from several different sources, strengthens this activity considerably. The teachers, student teachers, students, and visiting professor used all their senses and the natural data generation facilities associated with those senses in creating data around their experience in the story told here. The record used for the story is necessarily told through the sense experiences I had. But I attempted to include the perspectives of others as much as possible through quotations of their words and detailed descriptions of their actions. The 'Ask Questions' box in Figure 1 [https://edtechbooks.org/-ruW] identifies several types of questions inquiring educators might make in their studies. It should be apparent from the story that Sid and Cheryl were asking what would be the best action to take in this situation for Steve and for the other students. The student teacher, Jack, was asking what his ethical response should be to a student with whom he was slowly developing rapport and with whom he hoped to have long-term positive influence. I was asking descriptive questions about how this program and these people teach students to take responsibility for their own actions and learning. Steve seemed to be asking structural and contrast questions about how far he could push his mentors and the institution of school in learning to take responsibility for his own decisions. These were some of the broad questions being asked in this inquiry situation. Many other questions about the context of the story, the nature of the participants, and so on could be asked and may be as the inquiry continues. 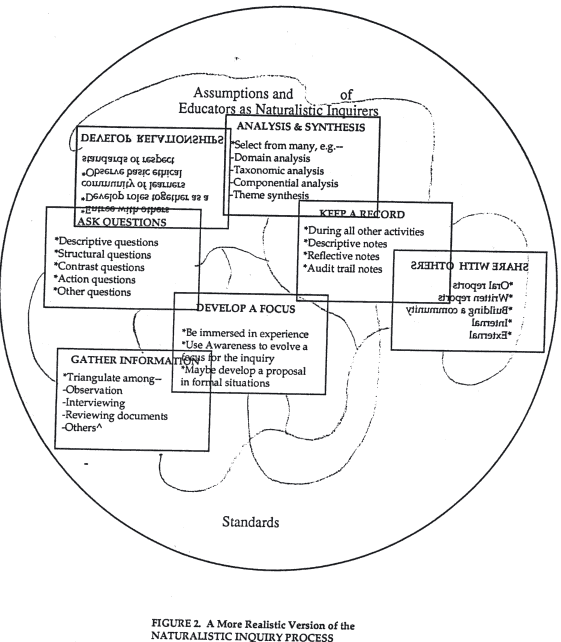 The 'Analysis-Synthesis' box in Figure 1 [https://edtechbooks.org/-ruW] suggests that participants are constantly interpreting their experiences and the information they are gathering. This may be done through on-the-spot analyses, such as during the meeting in the snowstorm when Sid, Cheryl, and Jack were attempting to understand Steve and interpret his actions in light of their larger purposes for the class. When they returned to school and talked further, they elaborated upon those interpretations, asked more questions, and gathered more information. During the interview with Steve, they refined those interpretations further, refined their relationship with him, asked more questions, and gathered more information as they made a decision. They explored the implications of their interpretations for the other students in the class too. As the recorder and visiting professor, I made interpretations by what I chose to write down during the experience and how I chose to write the story. In subsequent chapters, I will illustrate several other types of analysis (domain, taxonomic, componential) and synthesis (theme) that may be helpful in developing even richer interpretations of experiences such as this. The results of these interpretations may be helpful to educators trying to make practical decisions and should also be informative to others who make decisions in other similar settings. The 'Share with Others' box in Figure 1 [https://edtechbooks.org/-ruW] is a reminder that we learn best what we share with others. Inquiry is enhanced as we report and expose our experiences and interpretations with fellow inquirers and other interested audiences. It involves significant personal investment and risk because your perceptions (interpretations) are constantly open to challenge and inquiry by others who are involved. Sid and Cheryl orally shared what they were learning with one another and with others internal to the program, such as the student teachers, the school principal, their students, and me. They have also agreed to allow me to share their experiences and insights in this book and other written publications as a means of inviting others outside the program to join in an ongoing dialogue with us and build a community interested in how to teach and learn through ongoing qualitative inquiry. The circle forming the outer boundary of the entire Figure 1 [https://edtechbooks.org/-ruW] represents our 'Assumptions' about learning, teaching, and particularly about inquiry. Sid and Cheryl and the other participants made certain assumptions about their relationships with one another and the values they shared. For example, they assumed that to understand Steve and what to do about his decision, they would have to interact with him and be influenced by him. They could not remain immune to his values. They were not 'objective.' They also assumed that people have values which help influence what they do and say and that their values as teachers and as inquirers would influence not only what they did themselves but what they interpreted Steve and others to be doing. A major value they seemed to demonstrate was the importance of students being responsible for their own actions. As a participant in this experience, I assumed that whatever I would say about this experience might apply in other settings but could not be generalized blindly beyond situations with similar contexts and time frames. I also assumed that the reality of this experience was partially defined by the shared experiences of the participants but also was constructed in slightly different ways for each of them. Thus, I was interested in understanding each person's interpretation of what was going on, from their unique perspectives. In reaching conclusions about what happened here, we clearly could not conclude that there was a simple linear causal relationship between what Sid and Cheryl did and Steve's decision to leave the class. Rather, what he did shaped what they did and what the rest of the students might do and what Jack was doing. Lincoln and Guba (1985) refer to this kind of causality as 'mutual shaping' which is what most of us assume goes on all the time in human experience. As will be discussed in the next chapter, there were many other assumptions at play in this story as there are in all human stories. Thus, the circle of this hologram must be broad and encompassing. The circle in Figure 1 [https://edtechbooks.org/-ruW] also suggests that there are acceptable 'Standards' for conducting qualitative inquiry in ways that will encourage readers to find the conclusions credible and useful. Adherence to some of these standards was subtly indicated in the story through reference to the multiple sources of information used, the comparison of interpretations from multiple sources, the length and depth of participation by the inquirers, and other activities which will be explored further in chapter three. This review of the qualitative inquiry process in light of an example from a school setting suggests that many teachers, principals, and students probably are involved in inquiry as part of their work already, as were the participants in this story. But with a little more focus on inquiry as a basis for educating, they might not only obtain more valuable insights into helping their students but could also make discoveries about learning and teaching from their privileged positions inside the student-teacher relationship to share with others. In this book, I hope you will find that by thinking of yourself as an inquiring teacher, administrator, and/or student, you can further develop some of your natural inquiry skills. Perhaps you, like these teachers and their associates, can learn more about yourselves and your needs, as well as those of others. This may be important in helping you modify your practices in ways that will shape the attitudes you develop toward life-long learning and inquiry.